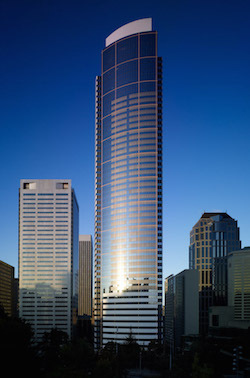 Apple has agreed to lease office space in the Two Union Square skyscraper in downtown Seattle, according to Bloomberg. The report claims that Apple will occupy the 44th floor and half of the 45th floor in the 56-story office building, which is a roughly 30,000-square-foot space that can house 120 to 200 employees based on standard corporate leasing ratios. Seattle has become a hotbed recently for Silicon Valley companies because of its talent pool and lower cost of living compared with the San Francisco Bay Area, with Amazon, Facebook, Google and Alibaba Group among the tech giants with offices in the region. Apple opened its first engineering office in the city last year after acquiring Union Bay Networks. Apple has hired more than 9,000 employees in the last year and now has a worldwide headcount of about 115,000, according to the report. The company's existing Seattle office focuses on core infrastructure services such as iCloud, suggesting the northwestern U.S. city could serve as a hub for its rumored high-speed content delivery network for faster cloud services. You obviously haven't been here in the last three months. Lower cost of living in Seattle? You just keep thinking that, there's too many damn people around here anyway. They ARE moving a lot of their advertising in-house (which is how my husband got called). I think that's all still in Cali tho. Thanks for the heads up! I'll keep a lookout for postings. But yeah, I have no desire to move to the Bay Area. I live in NYC now and comparatively, Bay Area/Silicon Valley housing/cost of living is INSANE. I sure hope Apple's iCloud infrastructure is robust and redundant when that massive quake hits. Hmm... Don't really know what to say about this one. Yeah he REALLY hasn't been here the last 3 months. Good grief.... this ridiculous summer will never end. And to think I moved here because I LOVE overcast skies and the sound of rain on my skylight.